In true Anne style, I'm a day late joining Patrice and the other ladies on Everyday Ruralty's porch, but that's okay - it means I have Wendell all to myself. 1. Beth asks: What's your favorite movie of all times? The one you've seen multiple times. Gods and Generals: it makes me cry more than any other movie. I want to will it not to be based on true events. I want switch it off at the initial song being sung to the showing of flags and of young men going to war. My heart aches for days and days after I've watched it. And yet I re-watch it. "It is well that war is so terrible - or we would grow to fond of it." The unavoidable truth is that there is a thrill to battle. This movie makes the reality of war so terrible to me that it makes me want to cry out to all the world's leaders: "Find another way! Don't send our boys to die if there is any other way." Last of the Mohicans: I love this music in this movie so much. It really goes to my heart. I'm not sure whether it's the music, the scenery, or, er, something else, but Daniel Day-Lewis is the only man ever to have his hair long and still look good. Because every other time: man + long hair = bleugh. I think I'm going off the subject here. Let's get back to movies. I love the BBC Pride and Prejudice, and never tire of cringing at Mr Collins' proposal, his fawning over Lady Catherine, and his ... well, simply his being Mr Collins. Such fun. Of course, we have to endure Colin Firth, but I guess it's a price worth paying. Apart from Pride and Prejudice, I think I'd be more of a 'guys' movies' kinda gal. I haven't watched any, mind you, in the longest time, so I'm not sure if that would still be the case. "My whole life flashed before my eyes...... It were really boring." make that movie worth watching. 2. Clairity says: Name three things that are permanent residents in your handbag or purse. #1. Crumpled up receipts that have been hurriedly thrown in there in a store. I chuck them in, fully intending to retrieve them once I get home. My intention, of course, is to throw them out, and in the process, to keep my handbag nice and tidy. That's the intention. What actually happens is that I discover them when I open my handbag to throw the next lot of receipts in. So, the receipts from week one are followed by the receipts from week two. And before you ask ... the receipts from week two will invariably be joined by the receipts from week three. #2. My purse. For any who are unsure: a purse holds money; a handbag holds a purse. Y'all got that? 3. Red asks: What's the best way to your heart? "Mum, I love you ... give me a big hug.". Ah yes, they know the way to my heart. Other ways may involve chocolate, tea or cake. More seriously, the way to my heart is to talk. I don't mean to blether. I mean to really talk. I am happy to chat for a while with people, but to get a place in my heart, I truly want to get to know that person: who they are; what makes them tick; what their delights are, and their fears; what they love, and what they hate. That is the way to my heart, I think. 4. Mamaw wants to know: Do you like going to yard sales? No such thing here in Ness! I guess everything would blow away before anyone was able to buy the stuff. Maybe I'll gatecrash one if I ever have another vacation across the Pond. 5. Cathy says: If you could slide down a rainbow, what do you think you'd find on the other side? Umm .... Pardon? Hang on a minute. I'm really struggling with this one and so I must conclude that I have no inner child in me, or that I heard far too few fairytales as a child. Or I'm a Lewis woman. Or a Presbyterian. Or a combination of all of the above. I honestly don't know how to answer this. So I'll show you a couple of photos instead. Yesterday, while the Wee Guy was doing his Maths, the snow began falling. So, the Maths was abandoned, and he joined his legion of Roman soldiers to fight in the snow. Two hours later, I was glad I'd allowed him his time in the snow, because this is what we had. But sadly, not enough snow lay on the ground even to make a snowball. Last year, the kids were able to make an igloo, but not even a snowball this year... it just doesn't feel right! awesome movies picks - i love the "last of the mochians". so a beautiful movies. i will have to look into "gods & generals" - not sure if i have seen it or not. Yes, you must look up Gods and Generals ... I'm sure you'd remember if you'd seen it - it's a real 'once seen never forgotten' movie. The rainbow question is just revisiting of folklore. I agree with the ones who found chocolate on the other side.I had the funniest visual pop up concerning yard sales with everything blowing away. I suspect the folks in Iceland would wonder what all of the junk was. :) Have a good week! Lol ... I'm thick sometimes!! And yes, you had the same visual as I had when I thought of a yard sale here in Ness! 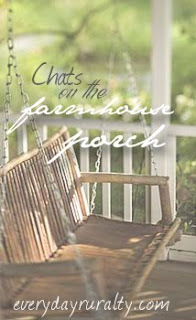 I always love reading your posts... and these "Chats on the Porch" are fun. If you can believe, I have never heard of the movie "God's and Generals", but now I think I will have to rent it... it sounds like something Steve and Eddie would like. I am always good for a war movie once; they are hard on me too, and I find them difficult to watch over again. We all loved "Last of the Mohicans" as well; and got the music sound track, because it was one of our favorites. It is a sad one too. When I was homeschooling the first four kids, we watched that movie, and though it was fiction, it corresponded so well to the French and Indian War Study we were doing, and in particular the story of "The Bullet Proof George Washington". If you haven't ever read that (it used to be in all the History books, but these days they don't teach history in the history books in public schools), it is a great one to read (David Barton has re-printed it, so it can be found), it just brought that story into a "real zone". I think we might have to watch it again. Love the BBC "Pride and Prejudice too." Loved hearing about your "receipt" problem, because it shows our likenesses again... it was like you were talking about me. The rainbow question would probably show our difference... I do find my imagination and inner child are probably excessively at work sometimes, and could fully picture myself in Scotland if I went over the rainbow.. Ha, ha.. Oh well, silly nonsense to be sure; I can't help it. I love that you can send a boy out to play in the middle of math for the snow... yes truly one of the best aspects of Homeschooling. Oh wow! Patrice recommended your blog and I'm so glad! I love that you can take impromtue breaks with homeschool for real life. (I taught mine at home for several years.) The movies you mentioned are now on my list of movies to be watched. I'm not much of a movie buff and so I try to watch those that are well recommended. Looking forward to next week! Oh yes! G&G is one of our favorite movies as well! I love the portrayal of Stonewall Jackson as a Godly man. And of course, that era is just fascinating, and I love "experiencing" it on film. Thanks for sharing!